AMHERST, N.Y. – Daemen College has received New York State Department of Education approval to offer a master’s degree in applied behavior analysis (ABA) starting in the fall, making it the only state-approved ABA graduate program in New York. In addition to the master’s degree, approval has been granted for Daemen to launch a new advanced certificate program to provide ABA post-graduate training for professionals in related fields. 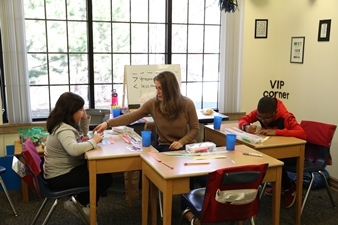 The master’s degree program, under the direction of Dr. Vicki Madaus Knapp, assistant professor of education, will provide comprehensive graduate training in applied behavior analysis, an intervention approach commonly used with individuals with autism spectrum or related disorders. Blending foundational skills with hands-on learning opportunities in various clinical settings, the program is designed for students who hold a bachelor’s degree in psychology, education, social work, sociology, or health promotion. Program graduates will be eligible to apply for licensure as a behavior analyst in New York State without the need for additional course review. Graduate ABA students will be required to complete 31 credit hours of coursework in the basic concepts and principles of behavior analysis, clinical change procedures, ethics and professionalism, and other core areas, a capstone research thesis, and 150 clinical hours. The advanced certificate program, which is among only four approved in New York State and the first in Western New York, is geared to students who already hold a master’s degree. Also scheduled to get underway this fall, the 28-credit certificate program will give students the opportunity to develop skills and a high level of competency in ABA. According to a 2015 report conducted for the Behavior Analyst Certification Board, the demand for behavior analyst positions more than doubled from 2012 to 2014, a trend also seen in New York State. The U.S. Department of Labor’s Bureau of Labor Statistics projects that employment in the psychology field, which includes behavior analyst positions, will grow 22 percent from 2014 to 2024, a rate much faster than the average for all occupations. Typically, behavior analysts are employed in school districts, clinics, hospitals, group homes, and agencies that serve individuals with autism spectrum and related disorders. Both Daemen programs will integrate a traditional classroom format with Web-enhanced learning experiences, with courses held in the evening to allow students the flexibility to complete their studies while continuing to work. Additional information on Daemen’s master’s degree and advanced certificate program in ABA is available by contacting Dr. Vicki Madaus Knapp at vmadausk@daemen.edu or call 716-839-8333.